Here's a copy of the final reminder email for the RAD Studio, Delphi and C++Builder 10 introductory offer and September special offers. There are no plans to extend the introductory pricing past September 30th. And upgrade pricing for registered users of XE4 and earlier versions will only be available when purchased with an Update Subscription starting October 1. If you are interested in either of those offers then you should purchase by September 30th. 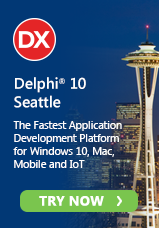 Now is the time to get new RAD Studio™, Delphi® or C++Builder® 10 Seattle! Get started with the fastest way to build and update data-rich, hyper connected, visually engaging applications for Windows 10, Mac, Mobile, IoT and more using Object Pascal and C++. BOGO - Buy RAD Studio, Delphi or C++Builder 10 and get a second tool FREE! Konopka Controls and CodeSite now available as free product choices. Call 1-888-233-2224 or click here to buy online before Sept. 30th. Quickly and easily take your applications and customers to Windows 10. The new Windows 10 VCL Controls are incredible! 20 new IDE developer productivity features including Clipboard History and Code Navigation Toolbar! Imagine what you can do with RAD Studio 10 and don’t miss out on these specials for early adopters. Buy or upgrade today!